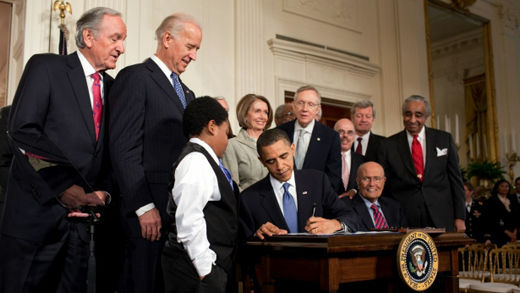 Almost every sector of American society greeted yesterday’s signing of a historic health care law as a major step toward guaranteeing affordable health insurance for all. 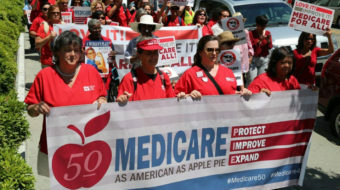 Labor unions, health care professionals, small business owners, retirees, students, and ordinary people from throughout the country applauded President Obama and Speaker of the House Nancy Pelosi for having the tenacity to push through what’s being called the most sweeping health care legislation since the establishment of Medicare in the 1960s. We join with those who hail this legislation both as a measure that will save lives now and begin curbing the insurance industry, and as a giant first step to further reforms that will provide quality, affordable health care for every person in the United States. Beyond that, its passage is a major defeat for the far right – the Republican Party, sections of Corporate America, and their fascist-like tea party shock troops. The enactment of this bill is an enormous victory for the broad progressive movement in our country. It will give energy and enthusiasm to that movement as it mobilizes and builds for the struggles ahead to advance a pro-worker, pro-people agenda. The far right has been left glaringly isolated but perhaps even more dangerously aggressive. These racist hate-mongers fought viciously to block the bill on behalf of the nation’s insurance companies and now say they will continue their dirty campaign by trying to repeal it. But it’s clear that an energized people’s movement will not let that happen. Even organizations and individuals critical of the bill (because of restrictions on women’s reproductive rights, or its exclusion of undocumented immigrants, or because it doesn’t go far enough) have acknowledged its importance and far-reaching implications. 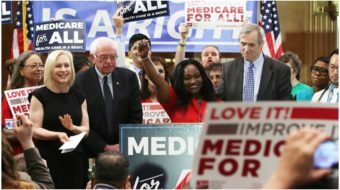 The great majority of health care reform advocates, including those who call for a single-payer system, see the legislation as opening up space to further the struggle for Medicare for all. Many note the bill provides a number of immediate benefits. 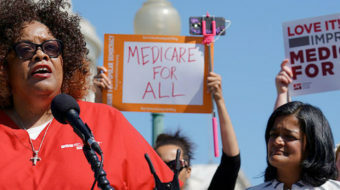 AFL-CIO President Richard Trumka called the bill’s passage a “momentous step toward comprehensive coverage” and vowed that labor will continue to advocate for health care that works for working families. The fight isn’t over. The corporate-backed far right will continue to use racism, lies and anti-government conspiracy theories to try to scare and confuse people. We got some ugly glimpses of this just as Congress was on the eve of passing the health care bill. Tea party protesters in Ohio yelled at and abused a man with Parkinson’s disease because he was courageous enough to show his support for health care reform. In Washington, others yelled racist and homophobic epithets at members of Congress. Some call it the tea-partiers’ Bull Connor moment. Connor was the racist, pro-segregation “public safety” commissioner in Birmingham, Ala., who used dogs and fire hoses against African American children standing up against Jim Crow in the 1960s. Just as the American people rejected the Bull Connor segregationists after seeing the fire-hosing of children in Birmingham, the American people will reject the vicious racism and hate-filled attacks of today’s Bull Connors. After almost a year of lobbying, demonstrations, petitions, rallies, health care story collections, town hall meetings, this is a moment to savor a hard-fought victory. And it’s a moment to celebrate the persistence and tenacity of the people’s movement for progressive change – a good thing since there are many more battles ahead.